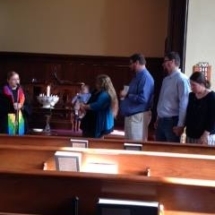 In the Unitarian Universalist tradition, children of any age can be named and welcomed into the wider community and the human family with a Dedication ceremony. Child Dedications are most often a part of a Sunday morning service. Parents or guardians and the child are invited forward, as well as any siblings, godparents, guide parents, or family members who are involved. The congregation pledges its support to the child and family; the godparents, family members and parents pledge their support for the child in body, mind and spirit. The child is named and the symbols of water and a rose are often used to express our gratitude for the original blessing or gift of life, our present happiness and future hopes for the child. Unitarian Universalists do not have a theology of “original sin” but focus on the potential goodness in all and celebrate the “original blessing” of life. Occasionally, arrangements will be made for a private dedication if that is needed or desired for health, mobility or other reasons. The minister can travel to a hospital for a child dedication. 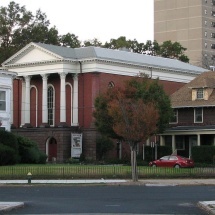 If you are a Bell Street member and interested in having a dedication, please contact us.